Full Band Show! Featuring one set of original music and one set we're calling "History of the 60's and 70's". All Ages. Admission is Free. Special trio show featuring John Ryder on upright bass! A full band acoustic show! Free and open to the public. Generously sponsored by the Friends of the Wellesley Free Libraries. This will be a full band acoustic style show. Outdoors on the patio! "We offer New American comfort food with style, in a welcoming atmosphere. We founded 753 South out of love for the feeling you get at your “good old neighborhood bar & restaurant”. We want to provide a welcoming, fun atmosphere with great comfort food and a bar where you can find anything from the basic to the adventurous, a comfortable meeting spot with a patio and live music, your local go-to place to hang out with friends. Come join us and see!" Ruby & Billy Carl will be doing a duo show. Classic covers and originals. About Emerald Rose: "Creative, delicious and affordable cuisine served in a welcoming, comfortable atmosphere by friendly, attentive servers." Full band show! Best Farmers Market in Boston! Full band electric show! We'll be rockin' at this one! Ruby & Billy will be doing the duo thing on Saturday, March 23 at The Emerald Rose Restaurant & Pub, 785 Boston Rd., Billerica, MA. Early show, 8pm-11pm. A full band show at at the Morrill Memorial Library "Musical Sundays Concert Series!" A one hour acoustic show with Joe on cajon and percussion. All Ages, Admission is Free! Plenty of free parking. If you would like to guarantee a seat(s) you can register in advance. Click here to do that. It's still free but you'll be guaranteed that you'll have a place to sit. To sign up for this event, call 781-769-0200, ext. 110, email norprograms@minlib.net or stop by the library Reference or information Desk. For information: http://norwoodlibrary.org. Ruby & Billy will be appearing live on the "Mike on the Mic" radio show (with DJ Mike Newman) on WMFO 91.5FM on your dial or streaming anywhere at https://www.wmfo.org Interview, a few live tunes and more. FULL BAND SHOW! The Morse Tavern is a new venue for us and we'd love to see many new and old friends. Great food and bevies. The Emerald Rose show in Billerica, MA has been cancelled due to illness. It has been rescheduled for March 23, 2019. Now located at the at the historic former Rossi's mansion in Millis, MA!. This will be our first show in the new venue. Come on out and check it all out! A duo show with Ruby & Billy Carl. Outdoors on the patio at the cool new restaurant/venue 753 South! This is the "After Party" for the 2018 Roslindale Porchfest Event. Admission is free and open to the public. Full Band Show! All Ages. Rain or Shine. We'll be featuring music from the 60's and '70's for this unique show. Outdoors in the courtyard. On days of extreme heat or rain, please join us in the branch library's Menino Hall. BUT-STOCK 2018 - All Day!! If you know about this party we'll see ya there! Yee-ha! Full Band Show! This is a brand new venue for us. We'd love to see all of our South Shore friends....and everybody else too! Full Band Show! All Ages. Trio show with Ruby, Billy Carl and Joel (on bass) We'll be going on at about 1pm until 2pm. Full Band Show! All Ages. Best Farmers Market in Boston! Full Band show! Open to the Public. All Ages Welcome. Sponsored by the Friends of the Morse Institute Library. Special Saturday night show with all Beatles music Featuring Bird Mancini, T Max, Quentin Callewaert, Nico Rivers and Blackgrass, Jeremy Todd and more. Full Band Show! All Ages Welcome. Please note this is the Endicott branch on Mt. Vernon St., not to be confused with the Main Library. Ruby and Billy will be the "feature act" at Julie Dougherty's Open Mic. You can sit and listen or you can bring an instrument/voice and join in. Fun! It's St. Patrick's Day! Full band show at this cool music venue. This is a Bird Mancini Band show featuring Ruby, Billy, Joel White on bass and Joe Jaworski on drums. It takes place at the newly renovated Roslindale Substation on the corner of Cummins Hwy. and Washington St. in Rozzie. Show starts at 6pm. A great place to chill out after work! You'll love the Trillium Brewery's selection of brews. All ages, Admission is free. Ruby & Billy will be appearing on Mike Newman's "Mike on Mic" show. Interview and live performance. Also, you can listen to the archive anytime after the show airs. Just go to http://www.wmfo.org/?page_id=3 and click on the Mike on Mic show. Featuring the Chandler Travis Philharmonic, Livingston Taylor, Jen Kimball, The Boy With the Amplifier Head feat. Sal Baglio, Merrie Amsterburg, Carla Ryder, Sarah Borges, Duke Levine, Alastair Moock, Amy Fairchild, Jenny Dee, Erin Harpe's Country Blues Trio, the Boston Typewriter Orch., Ken Field, Boogaloo Swamis, Bird Mancini, the Danny Devereaux & Ding Donnelly Christmas Special, Shaun Wortis, the Classic Ruins, The Philharmonic Trombone Shout Band, and the Athol Thingerth, with more TBA! Show starts at 7pm; suggested donation for tickets is $20.00 in advance, and $25.00 at the door; all proceeds go to the Somerville Homeless Coalition, which we think is an exceptionally excellent and worthy cause, and we hope anyone who can't attend will consider a contribution, which can be made here. A Full Band show! It's Halloween Weekend! The GAH has great food and amazing beers made right there. T Max and Bird Mancini have teamed up again to celebrate the classic music of The Beatles. During the night each of the two acts will play a short set of their own Beatles influenced music followed by an hour of them all performing Beatles tunes. The show has successfully made the rounds in New England having played to packed audiences in Marblehead (Me & Thee Coffeehouse), Gloucester (Rocky Neck Arts Center) and Dedham (St. Susanna Parish). Harry C. Tuniese of The Noise heralds the show as "A thrilling tremendous evening of music." Besides the big Beatles set finale, T Max and Bird Mancini will each perform short sets of their own Beatles inspired originals. 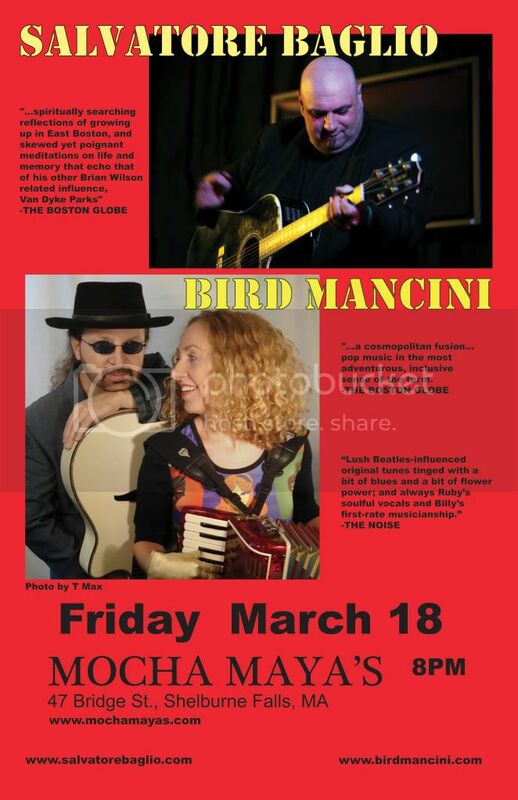 Bird Mancini was nominated for Best in Massachusetts at the 2016 New England Music Awards and T Max was inducted into the New England Rock n Roll Museum in 2017. And..."for all you youngsters in the audience"...opening the festivities will be 7 year old Jeremy Todd! This will be a full band show! The Roslindale Village Main Street Summer Farmers Market is different than any market in Boston, and it has been voted as Best Farmers Market in 2013, 2014, and 2016. A Sunday of Peace and Music fundraiser to support the Heywood Hospital of Gardner, MA. Food and beverages supplied by your favorite local venue, the PACC and their wonderful staff. Gates Open at 11:30 AM. The full band will be playing in this beautiful outdoor setting at the Hyde Park Library. If it happens to rain the event will take place inside the library. Sponsored by the Friends of the Hyde Park Branch Library. Ruby. Billy & Joel will return for a second season to The Back Room! We had a wonderful time last year. If your in the area...or even if you're not...it's a beautiful part of New Hampshire. You can make a weekend out of it. BIRD MANCINI and T MAX team up to each perform their unique music separately – and then combine their talents with a set of songs made famous by The Beatles. Presented by The Good Art Series. Trio show! We'll do one set from 1:45pm-2:30pm. Lots of fun things to see and do for the whole family. Event is rain or shine, free and open to the public. All activities, except canoeing, are under cover! Free parking. Full Band Show! Jasper Hill is a cool music venue and we're thrilled to be performing there. Hope you can join us...you'll love this place! Nominee, "Favorite Local Live Music Venue"
It's the annual Beatles show at Me & Thee Coffeehouse! We'll be playing a set of Beatles music with the effervescent T Max. Also on the bill are local favorites Scrambled Eggs and 7 year old pianist Jeremy Todd. Get your tickets early for this event! Full band show! This is an early show...we're on first so you can get in and out if you need your beauty rest. Or you can hang all night and live dangerously! Sons of Italy Hall, 30 Birch St. The Chandler Travis Philharmonic hosts the 12th Annual Boston Christmas Cavalcade for the Homeless at the Once Ballroom (aka Cuisine en Locale,) featuring the Stompers, The Boston Typewriter Orchestra, Jennifer Kimball, The Second Line Social Aid & Pleasure Society Brass Band, Amy Fairchild & Carla Ryder, Ramona Silver, The Weisstronauts, Erin Harpe, Shaun Wortis, Merrie Amsterburg, Rose Polenzani, the Darlings, Jen D'Angora, Alastair Moock, the Classic Ruins, Bird Mancini, the Revolutionary Snake Ensemble, Mike Gent, the Philharmonic Trombone Shout Band, the Athol Thingerth, and more TBA. Suggested donation for tickets is $20.00 in advance, and $25.00 at the door, and they may be purchased here. All proceeds go to the Somerville Homeless Coalition, which we think is an exceptionally excellent and worthy cause, and we hope anyone who can't attend will consider a contribution. And...imagine this...free parking in Somerville! Free, off street parking across Highland Ave and behind our building on Central Ave. Street parking (either metered or after hours) is also quite plentiful. The band Hummingbird Syndicate hosts a fun 3 hour variety show. Hall has free parking, seating and a full bar. Featured guests include Bird Mancini and Steve Gilligan Band. This is a full band show! Full menu and 6 house made beers! Share an evening of Artistry with friends, Lauren Passarelli, Kate Chadbourne & Bird Mancini - master musicians - for a warm, funny, intimate, musical, soulful, great time, with collaborations, and surprises. You will hear, guitars, voices, accordion, harp, piano, harmonica, melodica, melodian, poems and stories. You will feel entertained, enlightened, charmed and connected. Lauren Passarelli has been called the music world’s wonder woman for being a songwriter, performer, arranger, producer, recording engineer, owning a record label & being a Berklee College of Music Guitar Department Professor since 1984. A multi instrumentalist, singing & playing many parts on her own records, she has two CDs with arranger, Cindy Brown, under the band name; Two Tru, and six CDs on her own. Her music has been featured on daytime TV: CBS, NBC, & WGBH. Lauren also recorded other artists including: Ruth Mendelson, Kate Chadbourne, Crave, Thaddeus Hogarth, & Jane Miller. Pat Metheny has called her a great guitar player. Lauren’s early musical influences were: The Beatles, James Taylor, Stevie Wonder, Carly Simon, & Fleetwood Mac. New Englander’s know Lauren as, George Harrison, when she toured with the Beatles’ Tribute Band; Get Back, later renamed, All Together Now, from 1995-2007. Noticed on youtube, Lauren is now the lead guitarist in the solo Beatles’ Tribute Band, AfterFab since 2014. Boston's Bird Mancini is a cosmopolitan fusion of blues-tinged rock, Latin-flavored bossa nova, country-folk balladry, and woolly psychedelia, with lush vocals, guitar, accordion, and a variety of percussion, bells and whistles. In recent years they’ve toured the West Coast and performed for the International Pop Overthrow Festival in Boston, NYC, and The Cavern Club in Liverpool, England. The duo features Ruby Bird-vocals, accordion, melodica, harmonica, percussion; Billy Carl Mancini-vocals and guitar. Critically acclaimed and ASCAP/Boston Music Award nominees, Bird Mancini were twice named among the Top 10 Year's Best by Metronome Magazine. They've opened for Leon Russell, David Crosby, Joan Osborne, Gregg Allman, Jonathan Edwards, The Stompers, The Outlaws and others. This will be a rare trio show for us. Joel White will be joining us on bass. The Back Room at The Mill is one of the best small live music venues in NH. It's a listening room with a great atmosphere and wonderful acoustics whose reputation among live music lovers and bands alike has grown over the years. The Hippo says, "For performers, The back Room is an oasis from noisy bars that too often regard them with indifference. It's all about the singer and the song for the forty or so people seated in the 18th century building perched above the Newfound River." The region's largest multicultural environmental music festival located at Boston City Hall Plaza, Faneuil Hall and the adjacent Sam Adams Park. At this free event you can experience live music and dance performances from more than 20 countries, watch an eco-fashion show featuring local designers with models walking the runway in upcycled fashion, create a community-wide art piece, view a green film festival, test drive an electric car, listen to inspiring speakers, take a ride on a bike that generates electricity, taste healthy international cuisines, have a drink at the beer and wine garden, and much more. Boston GreenFest is a celebration of life and possibility, providing you with ideas and experiences that can shape your life and the life of your community. When summer comes to a close, see that it closes by opening a door to a greener future. Turn off your AC, call your friends and neighbors, and come explore Boston GreenFest! Bird Mancini duo is opening the show again for the legendary STOMPERS! Outdoors at historic Plymouth Memorial Park. Stage is to the right of Plymouth Rock. See ya there Pilgrim! Thrilled to be returning for the Third Annual Legacy Art Music Food Fun Festival! This time we'll be there as a trio...that is Ruby & Billy plus Joel White on bass. There will be music all day...many different acts of all styles. This event is free and open to the public. All ages show. Event is Noon to 6pm. Bird Mancini will be playing from 2:00-3:00pm. WILL HAVE SHUTTLES FROM ALL THE PARKING AREAS TO THE GOVERNOR AMES ESTATE. ALMOST ALL EVENTS, EXCEPT FIELD EVENTS, AND CANOEING ARE IN COVERED AREAS SO WE ARE RAIN OR SHINE! SIX HOURS OF LIVE MUSIC IN THE TENT...CAN YOU IMAGINE ...EVERYTHING FROM FOLK TO ROCK AND SOMETHING FOR EVERYONE WITH INTERACTIVE CHILDREN'S MUSIC ENTERTAINER AS WELL. ALONG WITH CANOEING, INTERACTIVE ART EXHIBITS, CHILDREN'S ART ACTIVITIES, WOOD TURNING, PAINTING POTS AND PLANTING HERBS, TOURS, COOKIE MONSTER KITCHEN...WE ARE INTRODUCING FIELD ACTIVITES WITH MEDICINE BALL MANIA, GIGGLE GOLF, AND SOCCER SKILLS AND DRILLS! FINALLY TETHERED HOT AIR BALLOON RIDES (EVERYTHING FREE EXCEPT THE HOT AIR BALOON RIDES WILL BE $15). and FOOD...WONDERFUL FOOD TO EXPERIENCE AND ENJOY...BEER AND WINE AVAILABLE IN THE TENT FROM 3-6 p.m.
On the night of Saturday, June 25, 2016, Bird Mancini and T Max return to help raise money for the Center by performing an entire night of wonderful songs made famous by The Beatles. Within the hits and their personal favorites, expect a lot of three-part harmony, familiar riffs, and the unforgettable melodies that have lived in our hearts and minds since The Beatles 1964 invasion. As an extra bonus, Cultural Center member Karen Ristuben will open the show with choice Beatles tunes. Another rock 'n' roll show with Boston's legendary Stompers! Bird Mancini will start the festivities followed by The Stompers. And there will be a few surprises too. We'll be doing one set with the full band.. Joe Jaworski on cajon and assorted percussion, Joel White on bass. This event is free and open to all ages. The whole band will be performing at this show....Ruby Bird, Billy Carl Mancini, Joel White & Joe Jaworski. Amazing Things Arts Center is a wonderful venue to see and hear music with theater style, comfortable seating. Beer, wine, snacks, etc. are available. This is a full band show with Joel White on bass and Joe Jaworski on drums and percussion. The Blackthorne serves great food and 34 of the finest craft beers on draft, wines of the world and awesome mixed drinks. Bird Mancini (duo) will perform 4 songs during the Valentine's Day service. Another Beatles Benefit! This time 50% of proceeds from donations will go to the St. Susanna Parish in Dedham, MA. T Max will play a set of his songs, Bird Mancini will play a set of their songs then T Max and Bird Mancini will team up and play a set of Beatles songs! Come and and sing along with us....you know all the words, right? Suggested donation: $25 -all proceeds to the Somerville Homeless Coalition. And if you can't come, poor thing, please make a donation! The Stompers Annual Thanksgiving & Anniversary Celebration! The legendary Stompers played their very first show in November 1977. The band has long been recognized for their raucous live shows; kept alive for more than three decades by a spirited legion of dedicated fans. The Stompers music appears in the John Sayles film, "Return Of The Secaucus Seven" and the cult classic, "Fraternity Vacation". Their radio hits include, "Coast to Coast", "Rock, Jump and Holler", "Eastside Girl", "One Heart For Sale", "American Fun" and "Never Tell An Angel" which both appear in Adam Sandler's "Grown Ups" & "Grown Ups 2" respectfully. The list goes on, as do The Stompers! The Stompers mission has always been to lift the spirt, shake the body and spread the mighty jubilation that is rock n roll. Keeping that tradition alive and kicking for more than three decades, the band continues to deliver the whole barn burnin’ roof raisin’ foot stompin’ ROCK N ROLL CHURCH to sellout audiences everywhere. Haverhill Universalist/Unitarian Church, 16 Ashland St.
Another cool coffeehouse show...this time opening for Les Sampou! The New Moon is an all-volunteer organization dedicated to supporting and enjoying the creative talents of up-and-coming acoustic performers. We strive to bring you the best performers in a relaxing, friendly environment, where you can enjoy a great show, good coffee, awesome desserts, and light food. Bird Mancini (duo) opens for the legendary Stompers on their mission to lift the spirit, shake the body and spread the mighty jubilation that is rock n roll. Keeping that tradition alive and kicking for more than three decades, The Stompers continue to deliver the whole barn burnin’, roof raisin’, foot stompin’ ROCK N ROLL CHURCH to sellout audiences everywhere!! The Stompers Live in Concert will include a full length show of Stompers originals and a special tribute Celebrate Lennon to commemorate John Lennon’s 75th birth featuring both The Stompers and Bird Mancini…And We All Shine On!! We're opening the show for another great Beatle Event! It'll be the full band but this time a bit more acoustic with drummer Joe Jaworski on cajon and assorted percussion (he's fantastic on this stuff! ), Joel White on bass, Billy Carl Mancini on acoustic guitars and Ruby Bird on her usual menagerie of instruments (accordion, melodica, harmonica, bells and percussion). TICKETS at the door or IN ADVANCE here: https://tickets.amazingthings.org/ -- The venue records your purchase and you give your name at the door. Discounts for seniors, students, and under 12s. All ages welcome. Amazing Things is a former early 20th century firehouse, beautifully restored and converted into a 200-seat theater in downtown Framingham. Snacks and soft drinks available for purchase. If you know about this event then we'll see ya there! Come out and sing along with us (you know the words). T Max, Bird Mancini and special guest Karen Ristuben celebrate the 50th Anniversary of the release of the HELP single! Remember what the B side was? You'll get to hear Ruby belt that one out too. Another full band show! This time at the coolest Farmers' Market in Boston. All ages and free admission. Join us for the 10th annual Beatles Benefit. Ruby & Billy will be doing Beatles songs, of course, with our good friend T Max. In fact everyone will be doing Beatles songs. You can sing along....you know 'em all! Allysen Callery, Britt Connors, John Fuzek, Annabelle Lord-Patey, Kyle Morgan, Ethan Robbins, Patti Rothberg, Scrambled Eggs, T Max and Bird Mancini. VERY LAST MINUTE! Billy Carl will be playing a rare solo set at The Minglewood Tavern in Gloucester, MA on Thursday, May 21. Check out the line-up! Holy Moly! You don't want to miss this one. Charlie Farren,Cosy Sheridan, Billy Carl Mancini, Tree House Charlitans, Kristen Miller, Patrick Nelson, T Max. This is a really cool venue just over the Somerville line in Charlestown, MA. "Great beer assortment, delicious food menu, terrific wine selection" Free Parking-a miracle in Charlestown! This is the debut of the four piece Bird Mancini Band at The Blackthorne! Come and join us! The Blackthorne has great food and bevies to keep you happy too. We'll be making a live appearance on the WMFO-FM radio show, "A Crash Course For the Ravers!" with host Brian Young. Tune in to hear Ruby's brand new Christmas song "Christmas Is Happy (For Fortunate People)" plus Billy Carl's "Because It's December". Also on the show will be Ronnie Deschenes and The Black Hat Project. Bird Mancini will be doing two original holiday songs: A Billy original called "Because It's December" and a brand new, never before heard Ruby original called "Christmas Is Happy (For Fortunate People)". The Christmas Cavalcade Benefits For the Homeless have been a tradition for a decade, in Somerville at Johnny D’s and in Orleans at the Jailhouse Tavern, raising a good deal of money over the years for the Somerville Homeless Coalition and the Noah Shelter for the Homeless, and giving some of the bay state’s best musicians a chance to get together and do seasonal songs that either aren’t in their repertoire at all or only appear for a few weeks annually. Sophia Cacciola and Michael J. Epstein Celebrate the Holidays! Suggested donation of $25. All proceeds go the the Somerville Homeless Coalition. Doors open at 5:30pm, show starts at 7:30pm. The format of the show keeps things lively, as usually no act plays longer than a couple of songs (except for the Chandler Travis Philharmonic, who act as hosts and occasional backup for some of the other performers, and have a large and constantly changing collection of sometimes riotous Christmas songs to draw on), which gives the Cavalcade shows the feel of a vaudeville holiday revue. Cat in the Cradle Coffeehouse is a wonderful venue that presents acts in a concert style setting. Wine, beer and snacks are available. Random Acts of Harmony will open the show. We'll be appearing on the "What's Happening" show on WMWM 91.7FM with host Aaron Bornstein. The show is on from noon til 3pm and we'll be going on a little after 1pm. If you live in the Salem, MA area you can tune in on your radio or stream live anywhere in the world from their website at www.wmwmsalem.com Call in if you like at 978-542-8500. This is a very cool event that features several singer/songwriters all on one night. We'll be on for a set at about 8pm but the show starts at 7pm. Wonderful food here as well. Jeff Philip, Randy Black, Bird Mancini, Ariel Strasser, Brian King, James Vasallo, Bradley Royds. T Max will host the show. A brand new venue for us! This is in the quaint and historic Fitzwilliam Inn in NH. Not to be missed! Imagine Gallery, 43 Rocky Neck Ave.
We'll be performing a one hour set from 3pm-4pm "in the tent" along with many other talented acts. This will be a great family oriented event in a beautiful location. During the spring 2014 reconstruction of Adams Park, Roslindale’s picturesque village green and home of the market, the market will be held at a temporary location at the Roslindale Village Commuter Rail Station on the corner of South Conway Street and Roberts Street. We're returning once again to open the show for the fabulous Stompers at The Blue Ocean Music Hall. We always love doing this one and hope many of you will come out to enjoy this high energy show. Ruby will also be singing with The Stompettes! Not to be missed! We'll be doing this show as a TRIO with the great bass player Sven Larson. Sven has played with us on several of our CDs and live shows in the past. So...this one's not to be missed! Sal Baglio will be performing many of his wonderful original songs. We're privileged to be counted among the friends in the band. Don't miss this show! All proceeds go the the Somerville Homeless Coalition. And be sure get there early for dinner, because not only is that a good way to get good seats, but Johnny D's is donating 10% of all food charges and gift certificates purchased tonight to the cause. We'll be back at the coolest little pub in Salem, MA! Come out and join us! However....if you are not a student and would like to attend this show just drop us an email request at birdmancini@aol.com and we'll add you to the guest list...and it's FREE! We'll be celebrating Lowbudget Records recent Monkees Tribute Album with a kickin' live show at the famed Johnny D's in Somerville with a cast of thousands! Save the date: Tuesday, November 5th at 7:30pm. Lowbudget Records' last show (The Beatles) was sold out, so you may want to buy the $10.00 tickets ahead of time (you'll get to pick your favorite table as well). On Tuesday, Oct. 29 at about 1pm EST we'll be playing a song or two live and doing an interview with Eli Polonsky on his WMBR Lost And Found show to promote our upcoming "Lowbudget Tribute to The Monkees" appearance (Nov. 5) at Johnny D's. If you live in the listening area (heard on-air throughout the entire greater Boston area within Route 128, and farther in many areas) tune in to the radio. This show is open to all ages and will be a fun one. No need to whisper in the Library for this show! Visit the Library's Facebook page here or the website here. We're opening the show again for that legendary band from Boston,The Stompers. DUE TO CIRCUMSTANCES BEYOND OUR CONTROL THIS SHOW HAS BEEN CANCELED. SORRY FOR ANY INCONVENIENCES. Come and hang with us in a very comfy lounge on the waterfront. We promise to play selections from our latest CD "Bird Mancini Lounge"! Ruby Bird will be singing with The Stompers. Yes, it's the return of The Stompettes: Ruby, Erica Rodney & Susan Cattaneo. Another new venue for us! We'll be appearing with singer/songwriter/storyteller/publisher T MAX. We'll each do two sets alternating between acts. The Grapevine describes itself as a Mediterranean Kitchen and Wine Bar. Click here T MAX for more info on T Max. We're opening the show for the Legendary Boston band, The Stompers. We did this show last year and had a wonderful time....even got to join The Stompers for their big encore songs. The Blue Ocean Music Hall is one of the best of it's kind it the area...and right on the ocean, Wow! The Best Farmers Market in Boston! Best little pub in Salem, MA! Great eats! The Hibernia is a new South Shore venue for us. We've been there to see friends play and had a great time eating drinking and being merry. Hope you'll join us at this cool Irish Pub with an illustrious musical history! We'll be appearing on Doug Mascott's "Traxx of the Town" radio show. We'll be on by about 10am and will be playing a couple of tunes live and showcasing the new CD, "Bird Mancini Live" You are welcome to call in to the show and ask questions, comment or anything you like....Studio Line 1-978-542-8500. We'll be teaming up with our good friend Mr. Curt for a set. We're promoting the release of new vinyl record, Bubbles in the Think Tank Presents "Eponymously Entitled" for Record Store Day 2013. We have a track on the record called "Solar Vinyl Compactor". The record has 6 cuts by different artists and all the songs are about records...a record about records on Record Store Day! We're on first at 9pm sharp! Admission includes a FREE copy of the new Vinyl Record! We'll be playing our new song, "Solar Vinyl Compactor" (co-written, recorded and performed with Mr. Curt) and more at this event. Ray Mason, The Weisstronauts, The Catbirds & Bird Mancini / Mr. Curt will all be performing....plus more artists to be announced. This is all to celebrate the release of a real vinyl record. Our first ever! A total of 6 songs by 6 different artists. Read all about it by clicking here. We'll be on this cool TV show performing live and interviewing with co-hosts Sara & Dann Maurno. Fantastic artist Brian Gordon also appears. For those of you who live outside Salem, MA you will be able to see the archived show soon on the Salem GASworks YouTube channel – stay tuned. This is a small theatre that features a Music Series as well as Theatrical works. Limited seating. This is a new venue for us on beautiful Pickering Wharf in Salem, MA. Amazing food and bevies here too! Chandler Travis Philharmonic, Livingston Taylor, Jenny Dee & the Delinquents, the Catbirds, Ray Mason, Erin Harpe & the Delta Swingers, the Jessica Schroeder Dancer, Miriam, Shaun Wortis, Bird Mancini, Sal Baglio, Barrence Whitfield, the Second Line Social Aid and Pleasure Society Brass Band, the Philharmonic Trombone Shout Band, and the Athol Thingerth, and a cast of zillions, TBA; 8pm. All proceeds go to the Somerville Homeless Coalition. Byfield Community Arts Center, 7 Central St. This is a great listening venue. Cafe treats and beverages (including beer & wine) are available. Over 250 artists, crafters and performers with local restaurants, youth activities, organizations and so much more! We're on at 3:30pm on the Cafe Stage. The whole event is from 11am-6pm. Price: Free all ages show! We'll be joined by fantastic bass player Rick Calcagni for two sets in beautiful Adams Park in Roslindale, MA. Bring a blanket or chair and enjoy a beautiful summer night in Roslindale's Adams Park. There will also be an outdoor movie immediately following our show. See you there! Come on out and join us at this beautiful waterfront venue. Great place to grab a martini after work. Madfish Wharf, 77 Rocky Neck Ave.
We're happy to be returning to play outdoors on Madfish Wharf for this very cool "NIGHTS ON THE NECK" event in the Rocky Neck Artist Colony. We'll be near Khan Studio and the Good Morning Gloucester Gallery, located on Madfish Wharf (along with 5 other galleries) near the Madfish Grill, The Rudder and The Studio Restaurants. There will be other acts performing at various Rocky Neck spots as well. We'll be joined by fantastic bass player Rick Calcagni for two sets in beautiful Adams Park in Roslindale Village. Stroll through Roslindale Village, grab something to go from a local restaurant, and settle down on a blanket in Adams Park for some live music! In harmony with the Summer Stroll, the Summer Concert Series is sponsored by the City of Boston Arts and Tourism. Many artists, poets and musicians all performing for Gloucester's annual "Nights on the Neck". We'll play one set and there's lots to see and do before and after that. All ages, admission is free! A new tavern for Peabody and a new venue for us! Come out and see what it's all about. We'll perform 2 sets between 11am and 1pm. All ages welcome. Buy veggies and listen to music all in one day! Come and check out this cozy pub in historic Salem, MA! Wonderful food, bevies and friendly faces. We'll be playin' and singin' from 5-7pm. This is a wonderful, mystical listening room with a nice hippie vibe....comfy chairs, books to read and buy, coffee and smiling faces all around! We'll be doing 2 sets. Pot Luck 7pm Music 8-10pm Limited Seating Admission $7 All Ages! Great food, intimate, friendly atmosphere …voted Salem's best pub! A Valentine Dinner & Free Musical Performance featuring Bird Mancini, Joe & Renee (from the Bandit Kings) and T Max. Yeah Yeah Yeah- 60's music in conjunction with the Roslindale Village Main Streets Holiday Wander. Everyone will be singing lots of Beatles tunes as well as some '60's chestnuts. @ Freda's Restaurant, 105 Copeland St.
Take Main Street one block from Watertown Square, then a right onto Church Street. First Parish Church is in the second block on your right. Awesome BBQ food at this one folks! We always love returning to this very cool, very popular venue in historic Salem, MA. Great food and bevies too! We're happy to be returning (for the last show of the season) to play outdoors on Madfish Wharf for this very cool "NIGHT ON THE NECK" event in the Rocky Neck Artist Colony. We'll be near Khan Studio and the Good Morning Gloucester Gallery, located on Madfish Wharf (along with 5 other galleries) near the Madfish Grill, The Rudder and The Studio Restaurants. There will be other acts performing at various Rocky Neck spots as well. If it happens to rain we'll be inside at Khan Studio. This show will happen Rain or Shine. We'll play a one hour set between 6:30pm and 7:30pm. This is a beautiful outdoor venue and family friendly. If it rains (and we hope it doesn't!) the show will be held in the library in Menino Hall. BIRD MANCINI OPENS FOR JOAN OSBORNE - Doors open at 6pm for dinner and seating. Show begins at 8pm. We're happy to be returning to play outdoors on Madfish Wharf for this very cool "NIGHT ON THE NECK" event in the Rocky Neck Artist Colony. We'll be near Khan Studio and the Good Morning Gloucester Gallery, located on Madfish Wharf (along with 5 other galleries) near the Madfish Grill, The Rudder and The Studio Restaurants. There will be other acts performing at various Rocky Neck spots as well. Bring along a blanket, chair, popcorn, bug spray and the enjoy music! material is from their excellent CD, “Everything Under the Sun”. acoustic blue-ness with rocky roots and captivating harmonies." together a one-man folk-rock opera called “Why Do We Go To War?”. 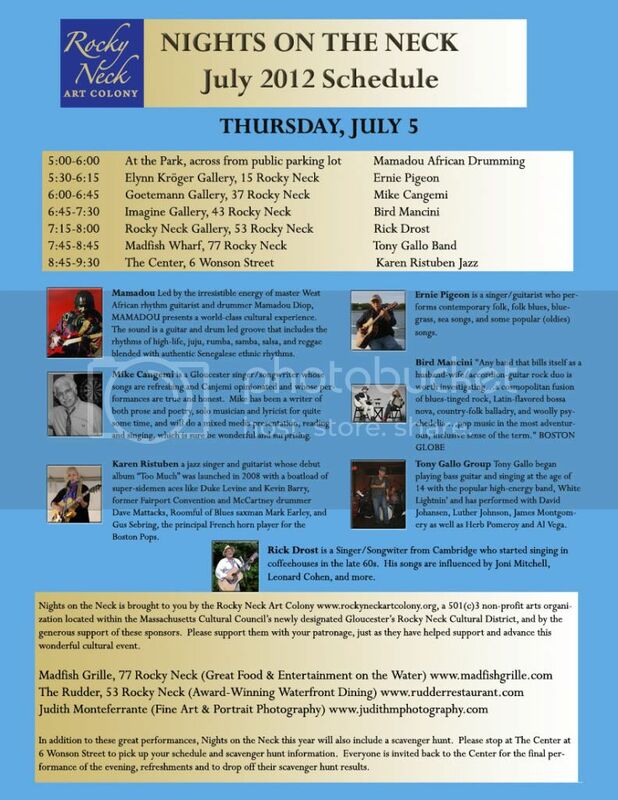 We'll be playing outdoors on Madfish Wharf for this very cool "NIGHT ON THE NECK" event in the Rocky Neck Artist Colony. We'll be near Khan Studio and the Good Morning Gloucester Gallery, located on Madfish Wharf (along with 5 other galleries) near the Madfish Grill, The Rudder and The Studio Restaurants. There will be other acts performing at various Rocky Neck spots as well. We'll play two sets. This is Boston's coolest Farmers Market. Bigger and better every year. We got rained out on June 11th so this show replaces that one. Let's hope for a beautiful day :-) It's free and all ages are encouraged to come and enjoy. We'll be performing a few songs live in the radio studio, playing a few cuts from our latest CD and chatting with DJ Doug Mascott. If you live in or around Salem, MA you can tune in on your radio at 91.7FM. Anywhere else in the world, just go to the WMWM website http://www.wmwmsalem.com and click on "Listen Live"
FEATURING: Eric Kilburn, Denny Williams, David Dodson, Dillon Bustin, Dean Stevens, Doug Day, Will Brown, Rachel and John Nicholas. Daisy and Stan, Lisa Redfern and more….. The Sweet Chariot Music and Arts Festival is a nationwide gaggle of performers who gather every summer on Swans Island, Maine, for a week of concerts, and for eight years running, this Boston event. Join us for another cavalcade of whoop dee doo, SWEET CHARIOT MUSIC FESTIVAL. 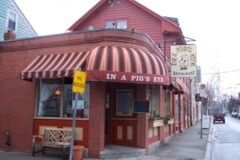 Come and join us at the very cool "In a Pig's Eye" Great food, brews and friendly people in an intimate setting. In historic Salem, MA! We'll be doing two sets between 8 and 10pm. Perks serves up some great salads, sandwiches, pastries and high test coffee! Intimate and comfy. Pot Luck 7pm Music 8-10pm Limited Seating Admission $5 All Ages! This will be our first time in at Chili Head Barbeque. It's an intimate atmosphere with amazing food and beverages. Yeah, it's a Wednesday, but a nice early show......in at 7, out by 9pm :-) All Ages! Here's what they say: Our original "down & dirty" dining area includes several cozy tables, an order window, a pick-up window and self-serve fountain drink machine. No spittoons, and no spittin' on the floor is allowed! We also have a full service bar area (our friendly bartender and wait staff will take good care of y'all), great for meeting friends and sharing some food and drink! Chili Head BBQ is located in Glad Acres Plaza, one mile east of Route 24 on Route 106. Take Route 24 to Exit 16 (Route 106) toward West Bridgewater. We are located one mile down on your right. This will be a full band show for us! This time we'll feature Rick Calcagni (from The Peacheaters) on bass and Larry Harvey on drums. We always love returning to In a Pig's Eye! Great food, brews and friendly people in an intimate setting. In historic Salem, MA! Free Admission. Mocha Maya’s is Western Massachusetts’ coolest coffeehouse and espresso bar now also serving beer and wine! This is a duo show and we're on at about 9pm. Mike Kirsch will open the show at 8pm. We've heard great things about this coffeehouse! Cat in the Cradle Coffeehouse boasts a beautiful theater style stage with professional sound & lighting. The coffeehouse maintains a fun, casual, social, cafe style atmosphere & offers plenty of free parking steps to the door that is handicap accessible. Beer, wine, tea, coffee, soft drinks, sweet treats and snacks will be available. LOCATION is easily accessible at Exit 55 (Central Street / Byfield / Newbury) off I-95. A Sparkling, Kaleidoscopic CIRQUE de MUSICALE! featuring Rock/Pop Arts to tickle the senses and warm your wintry soul! Under the Rock & Roll Big Top: BIRD MANCINI CD Release Celebration! Mr. Sal Baglio's THE BEAUTY & DISTURBANCE ORCHESTRA! and the fabulous INGE BERGE BAND! But wait...there's more! Ringmaster T MAX…dancers…Johnny Rhymer!…psychedelic art and videos...a plethora of Pandemonius Surprises that will Blow Your Mind!!! DON'T MISS THIS EXTRAORDINARY SHOW! SATURDAY, JANUARY 29, 2011 - 8PM doors open at 7:30. Admission $10. Full band Bird Mancini show with John Bridge on bass and Larry Harvey on drums. It's gonna be a great night of music and fun! BNN-TV / "IT'S ALL ABOUT ARTS"
We'll be talking about our new CD "Tuning In/Tuning" out with host GLENN WILLIAMS and playing a few tunes from the CD. BNN-TV / "IT'S ALL ABOUT ARTS" --Show Postponed! Our appearance on "It's All About Arts" on BNN-TV on 12/27 has been postponed because of the big Blizzard! We've been rescheduled for Monday, Jan. 3, 2011. The first show of the year! This will be our first time at Freda's! It's a friendly place....lots of smiling faces, premium cuisine, affordable prices and a variety of fine wines and spirits. This will be a cool night of acoustic music! Great food, brews and friendly people in an intimate setting. In historic Salem, MA! This is gonna be a wonderful night with lots of great bands. We're on at 7:30 sharp! It's a FULL BAND show for us. Sven Larson on bass and Larry Harvey on drums. Come by early…straight from work. A perfect way to start the weekend!